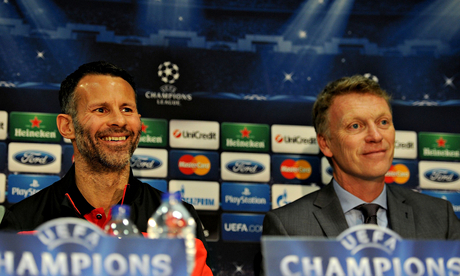 Ryan Giggs is set to be named as Manchester United’s caretaker manager following David Moyes’ sacking. An announcement from the club is expected later today, it is understood. United will also try to move quickly to install a permanent replacement for Moyes. It is understood that Holland boss Louis van Gaal is the favourite to take over, but another potential candidate in Borussia Dortmund manager Jürgen Klopp looks to be out of the picture. Van Gaal is reportedly among the front runners. The former Barcelona manager has an impressive CV and will be available this summer when he leaves his post as Holland coach. Borussia Dortmund coach Klopp is among the fans’ favourites to take over, but the club are understood to favour other candidates. Diego Simeone is another highly regarded figure in European football after taking Atlético Madrid to the top of the Spanish league and into the semi-finals of the Champions League. Moyes slipped into United’s base in Carrington unnoticed on Tuesday morning. Succeeding Sir Alex Ferguson, who won 13 league titles during his time at the club, was always going to be difficult, but few expected this season to have gone so badly. The list of unwanted records broken by Moyes is as embarrassing as it is long. United are guaranteed to end the season with their worst points total in Premier League history, they have failed to qualify for the Champions League for the first time in almost two decades while Moyes’ home record is the worst of any United boss since 1978 when Dave Sexton was in charge. United are seventh in the Premier League with four matches to go, with Europa League qualification now also looking unlikely.